Years ago, more than a decade, I can remember sitting in the audience as a well-known, seasoned author answered newbie questions. I was a newbie. I was so new I didn't know the double-spacing, do not use pink paper rule. I raised my hand and asked my question. "How do I go about mailing my manuscript?" The season author rolled her eyes (I was so new that I didn't realize every seasoned writer refused to use the term 'rolled her eyes' because of its literal meaning). Years later, I know that the reason she rolled her eyes (She didn't throw up her hands; she'd edited that phrase out of her life, too) is because she thought I'd wasted her valuable time. I should asked that question to not-so-newbie sitting next to me. It's thirteen years later, and you know, I'm still mastering the 'How do I go about mailing my manuscript?' dilemma. Sometimes I still forget and put it in a big manilla envelope, only to get to the post office and tear apart my manilla folder with it's fancy label. If I'm lucky, which I seldom am, it's a week before it's due and I can send it regular mail. Roughly fourteen times I've gone to UPS. They lost me one time by closing early. I was frantic and finally discovered a FED EX in the neighborhood. FED EX was so nice and helpful, that even though they cost more, I go there now. I'll be there in a few hours. I'll carry in my manuscript loose (it's in a rubber band and the disc is there too). FED EX has hard envelopes. I'll fill out a paper that has multiple copies and requires me to read lines that are much too small. Then, because I have to overnight it, I'll pay roughly what I pay to fill the tank of my SUV (Hey, I have a small child and a car seat and grandparents) and comes home to start the next book. I still have pink envelopes. I'ive had them for thirteen years. I actually sent my first manuscript out in pink envelopes. Hey! Maybe that's why it got rejected eleven times. It was such fun to read Cara's post about the ACFW conference. Our blog was so well represented among the finalists for the big ACFW awards this year--and it was sooo exciting to see Cara take a first place! I came away from the conference feeling incredibly blessed to be amongst so many wonderful writers in that atmosphere of faith and enthusiasm. And the workshops were amazing--I couldn't write notes fast enough, even though I knew I'd also be buying the conference recordings. There is always so much more to learn in this business! The photo, by the way, is of new Steeple Hill Historical author Pam Nissen and me. This is the first time I've tried adding a photo, and I hope it works! I loved the worship and devotion times. Such beautiful praise music--it really touched my heart. I'd love to find a list of all the beautiful songs we sang, so I could try to find recordings of them, as they weren't songs used in my home church. Then--if my kids can finally manage to teach me how to use an iPod, I could listen to the music, the recordings of all the wonderful workshops, and Angela Hunt's wonderful keynote talks, during my walks with our dogs. Angela is one amazing lady, by the way. After the conference, I went to Barnes and Noble, and bought her latest novels. But ahhh...technology. The world of iPods and iPod Touch and Zune still have me a bit baffled. So many features, and such a range of memory amounts, from one gig to 60. If anyone has suggestions on what to buy, I'd love to hear them! Last week I went to the ACFW conference and had a fantastic time seeing old friends and meeting new ones. I walked away on Sunday spiritually renewed and energized to write and write. From the opening meeting to the last event—Angela Hunt’s closing speech—I was captivated by all that happened. I taught a class and learned I need at least two hours to make my presentation rather than an hour. I couldn’t believe when the moderator said I only had ten minutes to go. I was only halfway through. I still had so much I wanted to impart to the people sitting in the class. This is a picture of me at the booksigning. In front of my poster for Forsaken Canyon, my October Love Inspired Suspense, is the sampler I have a novella in that is a prequel to my Love Inspired Suspense coming out in January called What Sarah Saw. The booksigning at the Mall of America was a great way to touch readers. I gave way fifteen samples I had left and wished I’d had at least thirty more. So many of the people who stopped to talk to me were just passing by. My goal was to spread the word about Christian fiction. I believe I accomplished that goal. I went to a class two mornings during the conference on police procedures. It was full of information I could barely get down on the paper. My hand was flying over my paper so fast. Good thing I bought the tape for the class. Mark was fascinating about the ins and outs of being a police officer or detective. On Friday night about twenty of us (writing for Steeple Hill) went out to dinner and had a blast. My editor, Emily Rodmell, went with us. It was nice to meet her in person for the first time. This is a picture of me with my editor, Emily. On Saturday night was the banquet for the conference. At this feast (the food was good) the Book of the Year winners and people who placed were announced. The Craftie Ladies of Suspense did great. 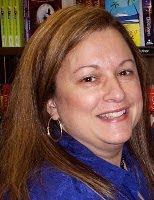 Debby and Terri came in third in the short contemporary suspense category. Pamela came in second in that category and I came in second in the short contemporary romance category. The picture is of some of the Steeple Hill authors all dressed up for the banquet. But the most important thing I brought away from this conference was the importance of the Lord in our life. I felt His hand throughout the weekend as did others. It was amazing! Washington Needs a Little Romance! With all the turmoil going on on Wall Street and Washington, it's comforting to know that we can escape to a little inspiration, romance and even suspense! Here at the CRAFTIE Ladies of Suspense, we love all three! I know I sure do. I was excited to receive my box of books from eHarlequin.com and began reading Margaret Daley's October 2008 release Foresaken Canyon. The book has followed me around all day. I'll keep my blog short and sweet today because I'm enjoying the book so much I do want to get back to it. Make sure you come back to see the character interview from either Kit or Hawke (I can't wait to see who Terri Reed interviews!). Once I'm done with Foresaken Canyon, I'll be sure to head back over to eHarlequin to list my books in the 100,000 book Challenge to add the books I've read recently. Remember, if eHarlequin gets 100,000 books logged in by readers, they will donate 100,000 to literacy. Having worked with special ed kids in grades 1 and 2 teaching them to read I can say that it is not only a great cause but a very satisfying one. Help give the gift of reading to someone and participate at eHarlequin.com! Crock Pot Recipe of the Week! Mix all ingredients except chicken and cheese in crock pot and stir Season chicken and place on top. Spread cheese on top of chicken. Cover and cook on low for 8 hours. I usually double this recipe for my family. Yum! I was going to add a lovely picture of my award, but that will have to wait. I thought I successfully downloaded Janna's pictures onto my computer, but can't find them anywhere so must have done something wrong. Anyway, Saturday night was the Awards banquet at the ACFW conference. It was so much fun to watch my friends win awards. In the first category, debut author, Robin Carrol placed second and Camy Tang won. Sushi for One is a wonderful book, so I am so pleased for Camy! Sharon Hinck won the speculative category with Restorer's Son which was a thrill to see. She is such a dear friend and fabulous writer! We finally got to short historical -- I think it was the last category called! I was beginning to be afraid I would have to leave the banquet to take care of Rebecca before they'd reach my category. I didn't want to miss my category, or in the alternative, have someone think I was leaving because I was a poor sport! There were six finalists in short historical, and they are all great writers, so I was incredibly honored simply to place. There was a corner of my heart that hoped I placed, but I knew that was a long shot. Ronie Kendig read off the third place winner Kelly Eileen Hake and then the second place winner Vickie McDonough. By then I was convinced I hadn't placed, and was ready to celebrate with whoever did. Then Ronie said, "The first line of the first - first place winner is "She hated attending dances alone. ..." I didn't hear another thing she said!!!! My editor, JoAnne Simmons, met me on stage. I wish Eric could have been there to celebrate with me since I wouldn't be writing books now without his prodding and support. But my mom and sister were there. It was so fun to honor Mom for all the years of homeschooling in that way. My friend Mary Connealy placed first as well. It is such an honor to share the award with her. She received the contract for that book in front of everyone at the 2005 conference. I remember thinking someday that could be me, and it was in 2006. How fun that we shared the award for best short historical! The American Fiction Writers Conference this year was better than ever. Membership is now 1700-strong with twenty-one chapters spread over the country. More than 500 authors were in Minneapolis last week for the Thursday to Friday event. At the opening of the ACFW conference, twenty-five editors and sixteen agents presented panel discussions, which gave all of us in the audience a chance to learn something about the publishing houses and literary agencies. The continuing education tracks started Friday morning. I attended John Olson’s class, ADVANCED FICTION WRITING: WRITING THE BIG STORY and loved his male POV and the way he presented the information. Check out John’s web site for more details, and be sure to sign up for his classes whenever you have the opportunity. 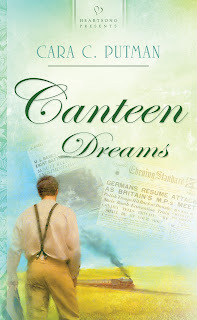 Suspense author Terri Blackstock gave an interesting program on UP ALL NIGHT SUSPENSE. I love Terri’s work so it was a joy to hear what she had to say. She’s from Mississippi, and we flew back to Atlanta on the same plane and chatted at the airport waiting for our flight to board. 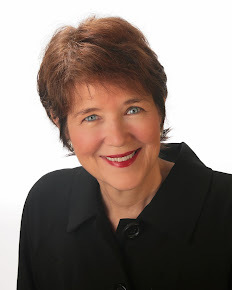 Terri focuses less on marketing and more on writing the next book, and from what she said, it seems she doesn’t attend many conference so I felt very fortunate to meet her at ACFW. Her next book will be out in February. I’ll be watching for it in my local bookstore. 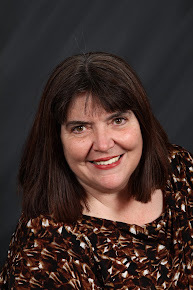 If you’re interested in writing Christian suspense be sure to read Terri’s work. Another good workshop was YOU WRITE LIKE A GIRL—HANDLING THE MALE POV. Rachel Hauck offered lots of insights I hadn’t thought of about male characters. 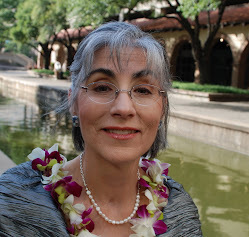 She and Susan May Warren provide editorial help to writers through MY BOOK THERAPY. Check them out online at www.MyBookTherapy.com. Rachel said an article about male POV would be posted at their site. Thursday night my editor Emily Rodmell, along with Steeple Hill authors Cheryl Wyatt and Dana Mintuk, had a Late-Night Chat about Steeple Hill. Emily’s a doll. This was her first conference and all the Steeple Hill authors loved meeting her in person and getting to know her better. One note on submissions, Emily said Love Inspired Historicals are now open to submissions set in any timeframe. Yes, even during the Civil War! Saturday I started off the day with a two-hour POLICE PROCEDURAL class by Mark Mynheir. He’s a homicide detective and writer who provided lots of good info. According to Mark, www.officer.com is the site to find answers to all our cop questions. He also recommended the book, PRACTICAL HOMICIDE INVESTIGATION, by Vernon Geberth. The mega booksigning at the Mall of America ran from 1-3 PM on Saturday. With over 100 authors, there was something for every reader in the crowd. Our own Craftie Lady Cara Putman organized the mega-event with buses to and from the Mall and a stage where best-selling authors discussed writing while the photos and book covers of all the authors flashed on two huge screens in the atrium. The shoppers who strolled by my table were thrilled to meet and talk with so many writers. Thanks, Cara, for all your hard work that really paid off! At the gala banquet that evening, we dined on filet mignon and enjoyed hearing which of our friends had won the big awards. Cara Putnam won in the Young Adult category and Craftie Ladies Terri, Pam, Margaret and I placed in the suspense genre. Dear friends Camy Tang and Mary Connealy, from my other blog www.seekerville.blogspot.com, also won in the debut and short inspirational categories! Way to go, girls! The conference concluded on Sunday with a worship service and an inspiring talk by Keynote speaker Angela Hunt. Saying goodbye to dear friends was hard, but at the same time, I was eager to get home to my family and start writing again. 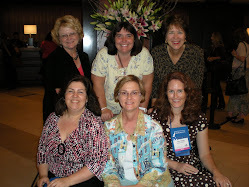 My “dream” for this year’s ACFW was to meet ten new writing friends and four industry professionals. In the warm and welcoming environment, it was easy to exceed those goals and a joy to get to know so many writers. If you attended the conference, post a comment about your experiences, your favorite workshops or tidbit of information you picked up. Next year, I hope many more writers will be able to attend. 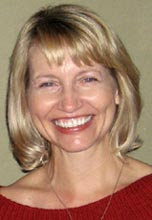 Debbi Macomber will be the Keynote speaker. Mark your calendars for the 2009 event, September 17-20th in Denver. Hope to see you there! Today we're welcoming RYAN MCCLAIN, the hero of DOUBLE CROSS, BY TERRI REED, A SEPTEMBER RELEASE. Wow, you've just had quite an adventure. I'd gone to the island of Maui to secure property for an investment group. The property was currently a flower farm but the farm wasn't doing very well. When I arrived to negotiate the deal, a fertilizer truck exploded. I tackled Kiki Brill, the granddaughter of the owner, to keep her from the safe from the debris. The police said a homemade pipe bomb caused the explosion. Someone was trying to force the Kaapa’s to sell the farm. Kiki was certain it was me. My honor wouldn’t allow her to believe I’d stoop to something so low. So I vowed to help her find out who was behind the farm’s sabotage. Little did I know how much adventure we'd find together. 2. So, during the book you met Kiki Brill. Tell us a bit about her. What was your first impression? When did you know it was love? Kiki is one tough lady. Exotic and beautiful as she is stubborn and prideful. But there was something so vulnerable about her as well. I could tell how much the flower farm meant to her and that touched me. She worked so hard to overcome the obstacles, namely a saboteur. Admiration and affection soon turned into love. But I didn’t really acknowledge that until it was almost too late. I have a head for business. My mom says I was wheeling and dealing before I could talk. But sometimes I become too focused on the goal and miss the special moments that make life worth living. Losing someone I love. I didn’t realize this fear until Kiki was in danger. I always thought my biggest fear was being poor, but love changes one’s priorities. I guess I’d have to say my driven nature to secure a financial future. I had a plan and I worked the plan. But then Kiki came into my life and showed me how my plans aren’t necessarily God’s plan. And His plans are always better. I know the Bible, I believe but my faith isn’t very deep. I learned that true faith comes with sacrifice and love. I learned that God is in control and happiness isn’t found in the material world. It doesn’t matter how good of a person I am or how much of the Bible I can recite, if I don’t live the truth of God’s love, then I'm not really a person of faith. This scripture is more for Kiki than me, but its message is applicable in everyone’s life. Chocolate covered Macadamia nuts. Sweet, salty, crunchy and so good delicious. Ending a book is a bittersweet moment. See, for months, those characters have been with me. They've sat in the car and told me things like, "You're not keeping us together enough." Lisa, my heroine, pouted because maybe I made her a bit too innocent. Greg insisted that I let more time pass by between the death of his wife and his first encounter with Lisa. Truthfully, Greg and Lisa are the first people I say good morning to and they're the people who send me off to bed. During the writing of a book, for the author, the characters practically live and breath. I'm at the end of this book. For the next week, I'll edit. I'm pretty sure I'm going to listen to Greg and put more time. Poor Lisa, she 'is' innocent. But that what makes the ending all the more suspenseful. And, as for their being apart too much. Well, they think about each other a lot. In about three months Greg and Lisa will return for a visit. They'll have changed (Thanks to the copy editor) and they'll change even more during the visit (Thanks to what the editor tells me to do). It will be a different relationship. We won't be as comfortable as before. They'll stay awhile and just as I'm getting comfortable with them (and while Tamara and Vince are tapping their feet and huffing because I'm not spending time with them), it will be time for them to return to New York. A month later, they'll come back again. They won't stay long. The changes won't be so noticeable. We'll sit down for a visit (called line edit) and then they'll be off again. I know that my last visit from Greg and Lisa will be August. They won't be coming for an exclusive visit with me. No, they'll spend time in lots of places (think book stores). They'll be dressed in their best and it will cost money (almost four dollars) just to spend time with them. Well, I can spend time with them for free, but truthfully, I'll hardly recognize them. By that time I'll be mourning the loss of Tamara and Vince. This is the last installment and Caron Smith is the writer who gets to wrap everything up. I hope you enjoyed this series that appeared in a local newspaper here in Oklahoma. We are in a critique group and decided to do this little "adventure." Caron Smith is a Jenks alumni. 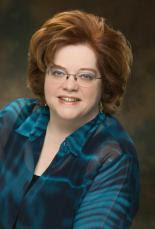 She writes romantic suspense and is a member of RWA, WIN, RWI, KOD, OWFI, ACFW and Tulsa Night Writers. KINGFISHER ANNUAL RATTLESNAKE HUNT: The words stamped on the burlap sack jumped out at Tory. Her heart pounded in her throat as she pulled the empty bag into the front seat. What did this mean? Slowly, an ugly suspicion filtered through her mind. The same fear that had erupted when she’d found the rattlesnake clogged her senses. Barry was her fiancé. Had he tried to kill her? At that moment Barry burst through the tea shop door. A glaring look of sheer contempt covered his face as he glanced at the sack in her hand. Instantly, she knew the truth. Barry was guilty. But, why? He rounded the car and jumped into the driver's side, shoving her hard onto the passenger seat. He flipped on the child locks, trapping her in the vehicle. “What's going on? I thought you loved me. We're supposed to get married." "That was only a backup plan. Think about it. I'm a banker. I bought your loan. With you out of the picture, all of this will be mine." He swept his arm out, indicating the tea shop and the land adjacent to it. I've got millions riding on this deal." "There’s nothing for you to understand. It’s all legal and above board. When they find your body in the lake, they’ll simply think you fell off your favorite lookout. Then, I’ll be rich.” He pulled out a revolver and jammed it against her ribs. Tory gasped. "You don't have the guts to kill me in cold blood." "I prefer the lake, but I'll do whatever I have to do to get my hands on your property." Choking back tears of disappointment, Tory straightened and met his gaze. "You murdered Gilford Richards, but his death was a mistake. You intended to kill me with that poisonous tea. The bookcase didn't simply fall by accident, you pushed it. Then, you put that snake in my car. But you failed, and you're going to fail again." "Don't underestimate me. Give me the keys, Tory. We're getting out of here right now. " "In a pig's eye," Tory yelled. She jumped forward, keys poised in her grip, aiming straight for his eyes. Barry dodged the blow, dropping the gun. With only a moment's hesitation, he grabbed the keys and started the car. The car lurched forward, but a police cruiser zoomed into his path. Detective Jamison jumped out, his weapon drawn and ready to fire. Barry threw the car in reverse, but a fire truck raced up behind, blocking his getaway. Detective Jamison nodded at another officer, who moved toward Barry. Tory reached down for the gun. Barry shoved her hand away and grabbed the weapon. He unlocked the door and jumped from the car. Outside, a deputy was waiting and knocked the gun from Barry's hand. Before Tory knew what was happening, her door was wrenched open, and Detective Jamison pulled her out of the car and into his arms. “No, he tried, but she faked him out. When her 911 call came in I was afraid I'd be too late to save you." "No, you're right on time," Tory murmured as she settled into his embrace. "So do you. I’ll ask Mrs. Beavers to fix us a cup of my specialty tea." He smiled when he saw the promise in her eyes. "If that's 'tea for two,' I'm your man." You certainly are, Tory thought. I'm quite excited that tomorrow I will be signing my book Her Only Protector at the New England Independent Bookseller Conference in Boston. I'll be giving away CRAFTIE LADIES OF SUSPENSE highlighter/pens to all the booksellers I meet. So if you're a New England bookseller and you're going to NEIBA make sure you stop by the Harlequin booth for a signed copy of Her Only Protector and a Craftie Ladies highlighter/pen. The mornings have been chilly these last few days and I've been sitting with a cappuccino and some books to keep me company until I get into my writing day. Right now I'm reading an older Love Inspired Suspense book that I plucked from my TBR pile. I'd been wanting to read a Marta Perry book and forgotten that I had a copy of Hide in Plain Sight. I've heard such great things about Marta Perry's books that I was excited when I found it! I also found a great reference book that I haven't used in a while. 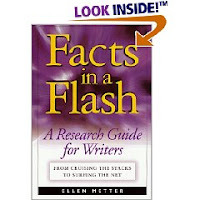 Facts in a Flash by Ellen Metter is a great book that helps you research just about any subject more quickly. The book is laid out by subject and gives you book titles you can research as well as useful URLs. I've dusted off Facts in a Flash and it has a new found home by my computer instead of on my exploding bookshelf. Here's what's cooking in the Crock Pot this week. Michelle Sutton and I serve on the ACFW board together. Her book, It's NOT About ME released this month. She's known as the edgy inspirational author, and from the first chapter or two of this book, that fits. This is her debut novel, and I had a few questions for her. It's Not About Me is not your typical Christian fiction. What was the germ that planted the story in your mind? I guess it was built on a premise. I asked myself how a young girl with a great life, good looks, and a solid upbringing would handle a tragic situation that robbed her of the future she had planned. Her only weakness is she always wants to make everyone happy. She learns, of course, that it's impossible to do that. You put your characters through the ringer. Which character did you connect to the most? Dan, who is the hero. He talks to God like they are close friends, but with submission on Dan's end to what is ultimately God's plan. Dan sometimes fights it and argues with God. Don't we all do that? What's the take away you hope readers will have after they reach the last page? That's it's worth it to wait for the husband God has planned for you. That getting married to make someone happy is always a bad idea. That once you go somewhere in a relationship you can never go back to just holding hands. That real faith is more than just going to church and being a nice person. That drinking to much can royally screw up your life and you can't ever undo the damage that is done. There is a whole lot more but those are the highlights. Who's the target audience for this book? 16 - 23 years old. The main characters are two high school graduates and one college graduate. However, people who have teens have told me that it has helped them with their relationship with their teens and opened communication. It's also perfect for youth groups because it touches on topics that don't normally come up. Also, everyone remembers being young once so honestly, I've got a bunch of over 65 year old ladies that are almost like groupies. They remember being young and they loved the story because it brought them back to those days. You call your writing edgy inspirational. What does that mean? That means there is always going to be something redemptive and inspirational in the theme of each story. Those themes happen within the context of the characters' disobedience or issues they have dealing with temptation and sin. Also, I don't smooth things over. They suffer the consequences and don't always make the right choices. That is where the edgy portion comes from. Yeah, I like to run them through the gauntlet emotionally, too. What did you learn while writing this book that was unexpected? What did the characters teach me? That approaching God when you are hurting is always better than hiding your pain and lying to yourself and others about how you are doing emotionally. Now for a fun question: If you could go anywhere in the world right now, where would you go and who would you take with you? I'd love to go to Australia to meet some of my reviewer friends, like Rel. I'd take my hubby and kids with me. Thanks so much, Michelle, for making the time for this interview. If you're looking for something fresh and different, then consider giving this book a try. My bags are packed, and I'm ready to head to the airport for the American Christian Fiction Writers Conference. Hopefully, I'll pick up lots of good writing information that I'll share with you next week. One of the highlights of the event will be seeing the Craftie Ladies and other Steeple Hill authors. Emily Rodmell, my editor, will be there, which will be an added treat. If you're at ACFW, be sure to say hello! My goal is to meet lots of new writing friends so don't hesitate to stop by my table at the booksigning or introduce yourself as we're passing in the halls. Each day I pray for my readers and fellow writers, so I'll be praying for your success this weekend. Happy writing! Happy conference! Safe travel! Stop by Seekerville today for my blog on THE DREAM MANAGER, by Matthew Kelly. 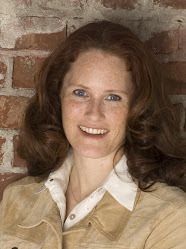 Today we're welcoming Sarah Roberts, the heroine of Badge of Honor, September 2008 release. Wow, you've just had quite an adventure. I'm Sarah Roberts, former FBI agent-turned street cop. I lived all over the country, yet when I decided I wanted to work in a smaller community and settle down, I returned to the one town I'd missed the most, Fossil Creek, Colorado. I was pleasantly surprised when their police force hired me. In law enforcement, we live for that adrenaline rush of a call, when something most people think of as bad, happens. We love the challenge of the unexpected. It's all in a days work, until the call involves family. I was shocked when, a few weeks into my training, my younger sister was the victim of a crime. That she remained the target of a predator rocked my world and forced me to take another look at what is important, in this life and eternity. After ten years with the FBI – it scared me to death to question my career, my future, and my every decision. 2. So, during the book you met Nick Matthews. Tell us a bit about him. What was your first impression? When did you know it was love? We went to high school together and he played basketball with my twin brother. Since he was two years younger than my brother and me, he was too shy to talk to me, and I was sure he didn't know I existed. So in that way, he's changed one hundred percent in fourteen years. He's not really shy now, but insightful. When we met again on the police force, I couldn't believe how quickly the crush I'd had on him in high school returned, despite my attempts to stop it. Since he was my training officer, it was impossible to ignore him, or my feelings, and it was even more dangerous to let my feelings for him show. Nick detested me at first because he thought I was here to investigate him on an Internal Affairs case he'd been included in. It wasn't easy to convince him otherwise. At the same time, I was trying to protect him from my family problems. In the process of learning the ropes of being a street cop, Nick and I had to learn to overcome trust issues, and falling in love was our reward. Being extremely short and petite, I've had to learn to rely more on my strong will and the element of surprise to keep the upper hand in the line of fire. My weakness is over-confidence and reluctance to trust others' capabilities. That's where it was nice to have Nick there to help me find that balance. I was born the bossy big sister, but "being right" isn't nearly as critical to my confidence as it used to be. Not being able to help someone, not being there when they need me is the worst fear I've experienced. That fear sent me to my knees to turn my fear into dependence on God. I have a difficult time letting go of responsibility. I always seem to take charge, which is going to be a big change in a marriage. Nick and I are trying to find the right balance, and with prayer and patience, it's working out. We know that it takes constant work, that sometimes we will both have to take charge, so we're sure that God will be our constant companion. I had wandered away from my walk with God as my job with the FBI took me away from home a lot. I left the FBI so I could be closer to my brother and sister, but I think God really pulled me back at just the right time, right before my sister's attack. Her faith showed me how important it is to keep walking with God all the time, not just when I'm able to go to church. Working with Nick also set a great example for me. I didn't just get closer to God to please them, I wanted to feel that peace and joy like they had. After so many tragic events, I realize I can't be strong on my own, I need God more than ever. I am still amazed to discover how much easier it is to make it through the bad aspects of my job when I say a little prayer to get me through. It's so basic, I can't believe it took me so long to get into step with Him again. And it's absolutely amazing to share that with fellow cops, and with Nick. Probably crème brulee, a hard top, but soft and mushy inside. Everyone expects cops to be hard-nosed about everything, but I think if they knew us better, they'd find most of us are really very caring and tender-hearted. Thank you so much Carol for sharing Sarah with us today. I really appreciated hearing from her. I look forward to reading your book. Recently a friend reminded me about the time, years ago, a medical examiner came to our local chapter (Go Valley of the Sun) and passed around some grusome pictures. Apparently I couldn't stomach looking at the pictures and left the room until the pictures were safely back in their BIG envelope. I have no memory of this event, but I believe her. Ten years ago I was writing very sweet romances for Barbour. Ten years ago my favorite show was WINGS. Yeah, I probably walked out of the room. In ten minutes, I'll be done with this blog and I'll go back to writing. I'm on page 250 of what needs to be a 280 page book. I'm aiming for ten pages a day. It's not a very sweet romance. But then, WINGS is not longer my favorite television program. By the time it died the death of every television series that allows the H & H to 'really' get together, I no longer watched. And my favorite television show: CSI New Orleans. I like the Miami one, too. I just started watching the New York one, and I'm a little leery. So far, I'm figuring out their murders a little too fast and I think it's because the third times a charm only if you've failed the first two. CSI didn't fail the first two. Soooo, the third one needs to be different - not the same. One last thing, this past April, I went to a conference and attended a workshop given by a medical examiner. She had slides. People left. Me, I raised my hand and asked some grusome questions. Last week, I talked about some of the ways a writer could make contact with editors. Another excellent route is to enter contests. There are a number of reasons why contests can be extremely helpful to the beginning writer. The fresh feedback from judges can help improve your writing. You learn to meet deadlines by buckling down and finishing whatever amount of a story is needed for the entry. Contests reinforce the need for professional, neat formatting for a submission (no pink paper or elegant script!) and the importance of following submission guidelines. The judges' feedback can help you develop of tougher skin when it comes to finding out that your "baby" isn't as perfect as you think. And finaling (or placing!) helps build name recognition for you. And when you've worked and worked at your craft, and are getting closer to being publishable, contests are a great way to make contact with any editors or agents who are serving as final round judges. If you've made that final round and they like what they read, they may request your full manuscript--which nicely side-steps the process of writing query letters. Query letters and brief synopses are an art unto themselves, so being able to get your work directly into the hands of editors and agents is a definite plus! Before I sold, I submitted only one query "blind"--without any previous contest contact with the editor. As required, I sent a query letter and a two-page synopsis. Nine months later, I got a nice personal rejection letter, but the editor didn't encourage me to re-write and re-submit that project. She said the story wasn't suitable for their line. In the meantime, the first chapter and synopsis of that same project finaled in a contest, and guess who, by chance, was on the final round judging panel! Now, she had to read my first chapter, and not just my lame attempt at a query letter. When I got my contest entry and scores back, she'd attached her business card to the first page and wrote: "Please send this full manuscript to me." The query that I'd sent earlier was probably poorly done, but a contest offered a second chance with that editor. Another perk is that such a request means one is sending material to an editor who already thinks she might like it, and is asking to see more! So..for those of you who are writing: have you entered any writing contests? What did you think? Were they useful? This installment of the murder mystery is my installments. 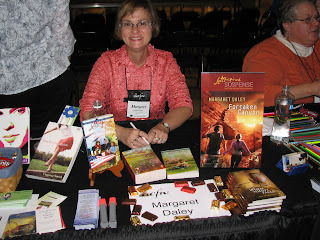 If you are interested in more about me check out my Web site at www.margaretdaley.com. The excerpt for my October Love Inspired Suspense is up on my Web site. The last installment will be next Saturday. “Mrs. Beavers, I know the police have questioned you, but are you sure you don’t remember anything unusual that day Gilford Richards was…” The word murder clogged Tory Bradford’s throat. She swallowed hard. “Was murdered here?” She still had a hard time believing someone died in this very office at Victoria’s Tea Shop. Mrs. Beavers scurried from the office before Tory could thank her for the tea. So much for investigating who was trying to kill her. She had hit another dead end. She’d paid Fred Crawley, The Book Worm’s owner, another visit, hoping he’d remembered something after a few days to think about “the accident.” But he hadn’t been able to help her either. He hadn’t seen anyone in his shop when the bookcase crashed to the floor, barely missing her. She’d even visited some of her neighbors to see if they had seen somebody near her car last night or early this morning. Again no one had seen anything unusual. Exhaustion, from three near fatal incidents, pressed down on Tory, her shoulders sagging. “Where have you been?” She took a sip of the soothing tea. Barry whipped around and hurried into the hallway. Tory followed. Smoke oozed from the kitchen. Her heart pounded as she raced behind Barry into the room. At that moment the fire alarm went off. Mrs. Beavers left with Tory while Barry went to the window to open it. “Men and their cars.” Tory exited the building and took a deep breath of the fresh air. Tory walked to Barry’s luxury sedan and slid behind the wheel, peering at the building. Smoke poured out of the open window. The sight made her hurry. She glanced back to check the alley before backing out of the parking space. Clear. She started to turn and put the car in reverse when her gaze lit upon a burlap bag on the floor behind the passenger’s seat. The black letters stamped on it froze her. Have you taken a break from reading or writing to watch coverage of the Election 2008 campaign? Most nights you can find me in my rocking recliner in my living room with a book in my lap and watching the commentaries battling each other about their positions on the election. I must admit I love the interplay and aside from listening to the debates, I've been noticing the mannerisms and details of the commentators and guests. It got me to thinking about the characters we write about. Good stories are all about the characters. If readers connect with characters, they'll stay with you all the way through the journey of the book, no matter where you take them. Two reference books I have on my exploding reference book shelf are 45 Master Characters and the Writer's Guide to Character Traits. While I love to people watch, either in person or on television, I sometimes like to research different types of characters outside of what I'd normally feel comfortable writing about. And sometimes I just want to color a character I have drawn in my mind just a little more. These two books help me do it. The first one, 45 Master Characters, is great for helping me define my character, deepen the motivation and help me make the character more believable by not making them do something OUT of character. The last thing a writer wants is for a reader to stop short in the middle of a story and question if the character's actions are believable or not. The second book, Writer's Guide to Character Traits, helps me get inside the head of a character. If I know my character is suffering from post traumatic stress disorder, I can learn about how that character would react. Or if my character was dyslexic, I could make sure I don't have a scene in my book where the character speed reads. If you're looking for ways to help round out your characters and make them more believable, you might want to check out either one of these books. Apple picking season is upon us. Here's a tasty autumn treat for the crock pot! Enjoy! Place all apples in the crock pot, open core side up. Mix nuts, egg, cinnamon, and brown sugar together and evenly fill the holes. In microwave, heat sugar, 1/3 cup water and butter on 50% power for 1 minute. Stir until dissolved. If you need to microwave again that's okay. Pour sugar liquid over each hole with nut mixture. Pour 1/2 cup water over all the apples. Cook on low for 8-10 hours or high for 3-4 hours. Serve with whipped cream or vanilla ice cream. The last two weeks God has been hammering me with the reminder that He is in control. You see I'm in charge of a 125 author booksigning at the Mall of America on September 20. 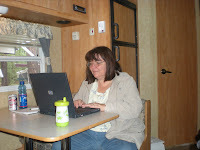 As ACFW's publicity officer, I was in charge of publicity for the event. And as a volunteer at the conference the last three years, I helped with the booksigning. It's always been a big event, but it feels like this year is bigger. First, we've moved the event outside the conference hotel. But not only did we move it out, we moved it to the largest mall in America. Second, authors' expectations seemed to sky rocket the moment I announced the venue last year at the conference banquet. Third, we're partnering with Barnes & Noble to run the conference bookstore...and we've never done that before. So this year, I'm responsible for all these firsts for the ACFW conference. It's been a daunting task, but one I've been happy to do, because it will help the visibility of Christian fiction in so many ways. But let's say working with others when there are so many outcomes that I can't control is ... stressful. The last two weeks were terrible as the conference bears down on us, but many loose threads still needed to be addressed. But those threads were so far outside of my control I almost couldn't breath. In the last two days I've spent hours on the phone, and I can now say they've all come together. I kept saying I knew God was in control, but I had a hard time relaxing and truly trusting Him. I kept asking people to pray, because it had reached a point there was nothing else we could do. I have a feeling God kept pushing the answers out, so that I would have to trust. To realize there was nothing I could control, but He had it all in the palm of His hand. Will there be other emergencies? Undoubtedly. I'm working with 120+ other people plus several companies. Something will come up. But will it all work out. Absolutely. Not because I'm wonderful, but because God is. And this is a chance to introduce people to Him through stories. It's going to be a great event. And I really hope you can join us if you're in the Minneapolis area. It's from 1-3 p.m. in the Best Buy Rotunda, a hallway, and the Bloomingdale's Court. Panels with authors will run throughout the event. If you love Christian fiction, this is the place to be. Are you like me? Whenever I’m in a bookstore, I go from book to book, reading opening lines. Some grab me, some don’t. Donald Mass, in his WRITING THE BREAKOUT NOVEL WORKBOOK, says the “intrigue factor” is the important element in memorable first lines. That’s what makes us ask, “What does that mean? Or, “What happens next?” The writer hooks us with those questions, and before we know it, we’re zipping through the story, reading page after page after page. To create memorable first lines, Maass suggests taking what we’ve initially written and then shortening it. Perhaps the second line would make a tighter opening. Or combine all the elements in the first paragraph and craft a hard-hitting sentence that draws the reader into the story. Maass warns against starting with weather, description or setting. Instead lead with a hook that keeps the reader guessing. Equally important are closing lines, which should also be well crafted. Books in a series need to leave the reader hungry for the next release. Stand-alone titles should provide an uplifting resolution or final thought the reader can savor. Let’s look at our own stories. Can we improve the lines we’ve written to hook our readers at the opening and leave them begging for more at the end? Check out my new Website created by Author Designs. Today we're welcoming Lindsey Taylor, the heroine of FINAL DEPOSIT, Lisa Harris, September 2008 Wow, you've just had quite an adventure. I’m a case worker for an adoption agency so normally life is pretty routine for me. In fact, the only thing I had planned this summer was to be a bridesmaid in my best friend Sara’s wedding. Until my father fell that same night and was taken to the emergency room. That was also the night I found a pile of letters from a collection agency on his desk. I knew right away that something was wrong, but it turned out to be more than a case of identity theft like I thought at first. My father had fallen for an internet scam and with it lost his entire life savings. What I didn’t know, was that this discovery was only the beginning. about him. What was your first impression? When did you know it was love? wedding was a surprise, but not nearly as surprising as the fact that I would end up needing him to save my father’s life. t fall for that? But so much happened so fast as we raced to find my father’s scammers that love was something forced to sit on the back burner until the bad guys were caught. I guess that’s when I knew for sure. We were standing on London’s famous Tower Bridge as the sun began to set behind the River Thames. Talk about romantic! I knew then that Kyle was in my life to stay. My greatest strength is probably the ability to relate with and help others. My greatest weakness? Giving it all over to God. It’s too easy for me to hold on to other peoples problems and try to fix things myself. Learning to let God be the one in control is hard, but something I’ve learned that I have to do. had to deal with these past few weeks with my father. 5. If you could change one thing about yourself, what would it be? It kind of goes back to my greatest weakness. I want to be able to find a balance in letting God take over while staying involved in peoples lives and helping them. Forgiveness isn’t always easy to grant. I had to make a choice whither or not to forgive those who had hurt me. In the end, I learned that granting forgiveness kept me from turning bitter and ruining my own life. And of course the ultimate example of forgiveness comes from God himself. He was willing to send His own Son to die for our sins. That’s amazing forgiveness. Unmerited and unearned. What an expression of love. of never giving up. We all face difficulties in this life, but we need to realize that they won’t last forever. Instead, they help to mold us, shape us, even strengthen us to produce for us a glory that will outweigh everything we’ve gone through. 9. If you could be a dessert what would you be and why? Right now? I’d say a slice of wedding cake from my upcoming wedding to Kyle. Aren’t happy endings wonderful! You're welcome for the invitation, Lisa. This book sounds exciting. Can't wait to read it! My cat Priscilla, a slender calico, is not organized. But, then in cat years she's about 140. Still, no excuse, I've had her almost 20 years, and I don't recall her ever being organized. So, here's the tail. Er, I mean tale. Priscilla (her husband was Aquila. He was an overweight black and white who didn't realize he was a cat. He thought he was 1/3 dog, 1/3 kid, and 1/3 cat. In other words, he came when he was called, he really love me, and he slept a lot)loves my office. Her favorite place is right next to my computer. She's lying here now. She arranges her body over my papers. Usually I really want to see these papers. They have my notes: lists of what I've done with the suspects so far (remember, I write suspense), a calendar with where and when the H and H are at any given time, and my grocery list notes (what to add, ideas, things to check). Often Pricilla's tail knocks things off my desk. I've found my eye glasses on the floor (Yes, I stepped on them). I've picked up reams of paper, now wrinkled and out of order. And, I own multiple sticky tape rolls. I have to clean my mouse pad and keyboard often. So, what is your cat doing? Wow--Lisa's recipe sounds delicious! I feel exactly the same way about crockpots--it's just wonderful having dinner all ready at the end of the day. I'm definitely going to try that recipe! Have you ever wondered how a writer, working away at a first manuscript at home, ever makes contact with the right publishing house and gets her book sold? I'm asked this question a lot! 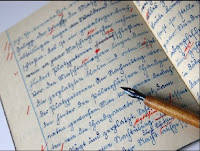 If you'd like to write for Steeple Hill, you can look up the writing guidelines at www.steeplehill.com. Look down at the bottom of the page, and click on "writing guidelines." Once you get there, page clear down to the bottom, where you'll find a variety of Steeple Hill links to click--one for each of the types of inspirational novels they publish. For instance, click on Love Inspired Suspense, and you'll find information on the types of books the CRAFTIE LADIES write. There are certainly no "formulas" to learn, but rather, you'll find some helpful basic guidelines about story length and content, the publisher's address, and the names of the editors, so you can send your material to the right place. What if you're interested in different publishers? One can find out how to submit to them by researching them online, or by checking books like Writer's Market or Jeff Herman's Guide. Be aware that some houses require an agent, and some don't. Some want just an initial query letter; some will accept that letter plus some chapters and a synopsis. Another option for gathering information is to join writers organizations, such as American Christian Fiction Authors, or the Faith, Hope & Love Chapter of RWA. There, you'll find wonderful networking opportunities. Information on regional and national conferences, where you can take workshops and also request appointments with editors, so you can tell them about your manuscript. And you'll also be able to find out about upcoming contests, which can be very helpful--in a variety of ways--on the journey toward becoming published. I'll talk about that a bit more next Sunday. Until then...best wishes to you all! 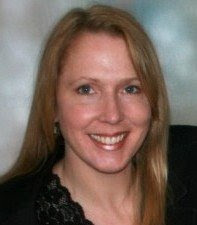 Jan Warren wrote this installment of the 6 part series called Murder on Main Street. I will post the 5th and 6th installments in the following Saturdays. 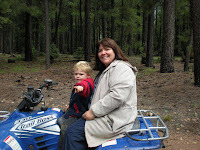 Jan Warren loves the Lord, her children, grandchildren, cooking, country living and writing. 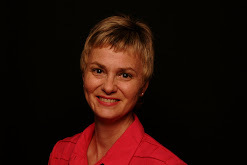 She writes inspirational romantic suspense and has finaled in 2007 in the Daphne du Maurier, and took first place in the 2006 Where the Magic Begins contest. She also writes book reviews for Armchair Interviews. Visit her Web site at www.JanWarrenbooks.com. Icy fingers of shock remained wrapped around Tory Bradford’s insides as she and Detective Ethan Jamison waited for the animal control officer to open her car to extract the rattlesnake. The officer reached for the door. Tension filled the air as the gathering spectators edged closer. “Sure.” Tory hoped she remembered. She tried the code. Silence. More snickers. “Break out the window. We don’t have all day,” a man yelled. Murmurs of agreement spread throughout the crowd. Think! She reversed the numbers and prayed. The metallic click of the releasing door locks made her jump back. A flick of the animal control officer’s hand and the driver’s door swung open. “Whoa! That’s the biggest timber rattler I’ve ever seen!” He jabbed a pole with a forked end into the vehicle. Loud thumps and muffled expletives were followed by his exit. He clutched the five-foot snake behind its neck, fangs exposed. The crowd backed up as the viper and his wrangler headed for the truck with the cage. Tory turned from the sight, nausea threatened to close off her windpipe. “Ms. Bradford, you said your car was locked last night. Who else has a key or the entry code?” Jamison’s blue eyes narrowed. “I only have the one set.” She rubbed her aching forehead. “Mrs. Beavers knows the code so she can get supplies out of the car when I’m busy. Oh, and she told my fiancé who used it once to leave me flowers.” She should have called Barry. He’d be worried about her when she didn’t show up for their morning tea. Another officer handed Tory her purse from the car. Jamison intercepted the book she’d used to deflect the venomous strike. Two puncture marks were evidence of her encounter. A chill slithered down her back at the memory. “That was a close call, Ms. Bradford. A bite from a snake that size could kill someone of your slender build.” After placing the book in a plastic evidence bag, Detective Jamison touched the indentations. If she didn’t know better, she’d believe the handsome detective sounded concerned. Then she saw something in his expression. Worry? “Y—you think the poisoned tea was meant for me, too?” She hoped he would correct her, but he glanced down. Numb, she nodded, and he walked away. The last of the spectators disbursed, too. Who knew, the very person responsible could have been watching from the crowd, amused at her cowardly response. The icy fear which had surrounded her since Gilford Richard’s death turned to heat as anger raced through her veins. “I will not be run out of town by some lunatic.” Now all she had to do was find out who and why before they succeeded in killing her. I'll admit I'm a reference book junkie. I love reference books and have bought enough to overfill the shelf in my office. It's gotten so bad that I have to check my shelves before I buy any more reference books because on more than a few occasions I was ready to buy a book only to discover I already owned it! While I'm not a heavy plotter, I do love research. Having the reference books handy sometimes helps to jump start me when I'm stuck. For instance, when I'm first starting a story and know very little about it, I check out a book called Writer's Guide to Places. I can peruse the pages, find out interesting things about a particular part of the country such as Indiana has a town called Santa Claus. That might help spark an idea about a Christmas story some day. And I absolutely love Christmas stories so don't be surprised if you see a story set in Santa Claus, Indiana from me down the road. And more highways intersect in Indiana than anywhere else in the country, which is why Indiana is nicknamed "Cross Roads of America". Hmm, it has a series feel to me. Another good book is Careers for Your Characters. Just skimming through that book helps to get me started shaping a character. Of course, not all research can be done with books. I happen to have a wealth of police research available to me in my neighborhood (5 police officers, including one on the S.W.A.T. Team, live on my street. ) and even in my own home. My husband, Tom, a former Marine and graduate of the Army Ranger School is also a police officer in a neighboring town. So anytime I'm wondering about what my character would do or how the police would handle a situation, all I have to do it ask my husband or invite Officer Dave over for coffee and Dave and Tom can fill me in on anything I need to know. My neighbors know I write romantic suspense. It's a good thing. But every once in a while they do forget and I scare them. I got excited about a book idea once and called my neighbor who works as a Med Tech screening blood. The phone conversation went something like this. "Hi, it's me. If I want to make it look like I killed someone and use a lot of blood so it looks like they died but they didn't, how much blood would I need and how could I do it so no one would think the blood came from a blood bank?" Silence. "You are writing a book, Lisa, right? Please tell me you are." After her heart started beating again, she explained the correct way I could make something like this happen IN MY BOOK. Research is important. Do it wrong and your readers will immediately be pulled out of the story. Get it right and readers will become completely engrossed in the story so that they'll feel like they're living it along with the characters. Okay, it's September and that means I've pulled out my crock pot again. I love my crock pot because when I remember to set it in the morning and then get lost in my writing for the day, I'm usually exhausted by dinner time and tempted to order a pizza. Putting dinner in the crock pot always feels like someone else has cooked dinner for me. Here's a new recipe for those who love to use their crock pot! Put all the vegetables except for cabbage on the bottom of the crock pot and then place the corned beef brisket on top. If the corned beef came with a spice packet, sprinkle that over the meat. If not, season the beef with peppercorns. Pour 1 1/2 cups of water over the brisket. Cover and cook on low for 8-9 hours. Add cabbage wedges to the top of the crock pot, turn to high and cook for an additional hour. Enjoy! This past week, Mother Nature illustrated what WRITING THE BREAKOUT NOVEL WORKBOOK, by Donald Maass, focuses on in the twenty-fourth lesson: tension. The entire nation has been glued to the television, watching Gustav. 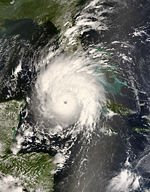 First a tropical storm far out at sea, the swirling mass slowly and steadily took shape, gained strength and methodically cut a path toward New Orleans. Collectively, we held our breath in anticipation. Tension was high, then climbed higher as America braced for the killer storm. Of course, the story didn’t end with landfall. Hanna now follows with Ike and Josephine close behind. If Maass stopped by today’s blog, he’d probably say something about following Mother Nature’s lead. According to Maass, “Tension on every page is the secret of great storytelling.” But breathtaking suspense that builds as a killer storm threatens the coast of the United States or that in suspense novels sends chills up our spines isn’t the only form of tension. Equally as effective is the subtle tension woven into dialogue or revealed through introspection that keeps the story moving forward and the reader turning the page in anticipation no matter the genre. I’m in the midst of rewriting my fifth story, PROTECTION HER CHILD. The story revolves around a woman on the run. Lots of action. Lots of suspense. Today, I’ll be flipping through the manuscript, doing a double check and ensuring I’ve built tension into every turn. Then I’ll add more. Tension tightens our stories. Now go tighten yours by upping the tension on every page. Visit my new Website created by Author Designs. Today we're welcoming Mason DuBroc the hero of The Face of Deceit by Ramona Richards, September. Wow, you've just had quite an adventure. Thank you, cheré. I am most proud to be your guest. I apologize in advance if I clip you a bit with my hands. They tend to fly about when I’m talking. Yes, an adventure it was, one I wasn't convinced we would survive. I am an art crime investigator by profession, art historian by training. Born in Louisiana; my father was Cajun, but I travel a lot investigating art thefts and vandalism. I had come to the Jackson's Retreat writer’s colony to work on my next book, but when I saw Karen’s vases in a window, I became totally fascinated by her work. I had to know more. Her vases, of course, turned out to be clues in something much bigger – a murder. 2. So, during the book you met Karen O’Neill. Tell us a bit about her. What was your first impression? When did you know it was love? Her vases made the first impression, and I saw them in a gallery. “Face vases.” They were brilliant, just brilliant, a unique design with these gorgeous flowing colors and a starkly distinctive face on one side. Immediately, I knew this was a creative, passionate person. I had to meet her. I went to her home and found her up to her elbows in wet clay, this dazed look on her face. I knew in that moment I had to know her better. Love. Ah, that grew from our friendship. I think I knew before she did, especially when that monster began to threaten her. I realized I didn't want to live without her, that I wanted to be the man who deserved her love. Ah, we are all human, are we not? I think my strength is also my weakness. I can be very, shall we say, focused. It allows me to pursue great things, but I can also get a little blind to the world around me when I do. Hm . . . I used to want to be James Bond, but I’d probably shoot myself in the foot. So suave, that one. I’d like to be suave, but my mother once told me I was too much like my father to be a ladies man. The DuBroc men tend to love intensely, to the end. I may stumble over my own hiking boots, but I’ll always catch my lady when she falls. Lukewarm, unfortunately. I believed in Jesus Christ as my Savior, just not openly or very well informed. That’s where my Karen comes in. Her faith is so solid, she brought me around, just by her example, her steadfastness. In her I finally saw a deep faith that sustains. Psalm 5 has long been seen as a prayer for those who are weary from life’s battles. It is a prayer of David’s when he was under great duress from his enemies. And verse 3 is an incredible reminder that even in the midst of trials, our God is a prayer-answering God. He answered David, and He will answer our pleas. Tiramisu, I think. Yes, a little sweet, a little tangy, a bit exotic. Ha! There’s another answer for number 5! I’d like to be more exotic! Thank you Ramona for sharing Mason with us. He is a very interesting character and makes me eager to read your story. My family and I just spent the weekend camping. I have one word to describe our trip: rain. Oh, yeah, my husband investigated the weather channel before we left. He even found a nifty site online that had a graph. We left Scottsdale knowing that there was a 30 percent chance of rain on Sat and a 50 percent chance on Sunday. All I can say is we should have camped in a boat! Oh, it was fun, though. We arrived Friday evening, missed our regular camp site to poachers (think campers who arrived before we did) and found an even better camp site. Saturday we managed a short ride before the rain hit. My three year old tried to behave while trapped in our camper for hours. He watched A Bug's Life three times. Maybe I should say I played A Bug's Life three times. He spent the time racing cars on the table (where I wanted to type) and climbing on Daddy (who wanted to sleep) and whining. I understood completely; I wanted to whine too. The sun came out and we managed a short ride. We ate huddled in the camper while it rained. Then, we watched A Bug's Life again. It rained all night, but we managed to sleep anyway. Sunday we had to wait for the rain to stop. We did one short ride where we climbed a downed tree and found really cool mushrooms. No, we didn't pick them. 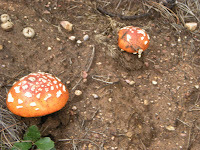 They were just the biggest and brightest colored mushrooms I'd ever seen. The rain chased us home. Guess what we watched on TV? And, every camper alive who takes a three year old with them will say, "Yes, the television can be your best friend on a camping trip when it rains." A few hours later, we took the quads out and had one of the best rides ever. We were out for like five hours. It was almost dark when we finally returned to the campground. Mikey was falling asleep. Of course, he woke up the minute we tried to put him down. This morning, we packed up. I managed to write early in the morning, and some during the rain. All in all, I call the weekend a success. Are you writing, and hoping to be published? Have you ever received a rejection? I sure have! And I count those rejections as true blessings in my life. They hurt deeply at the time, of course. Before I first sold, I received several, and I was sure those rejections were a sign that I never would sell. But you know what? I look back and see that each of them guided me onto a different path. Helped me work at improving my craft. Taught me valuable lessons. According to a B&N interview, Ray Bradbury had over a thousand rejections over his thirty year career. Jasper Fforde received 76 rejection letters before his first novel was published. Madeleine L'Engle's A Wrinkle In Time was rejected by 26 publishers. It's now in its 69th printing. The author of "Who Killed Virginia Woolf? was told her book wasn't publishable. Then it sold--and reprints have been selling for over eighteen years! The book, The Princess Diaries was rejected seventeen times. Then it sold, became a best-seller, and became a movie. Accounts vary, but one source says J.K. Rowling was rejected by nine publishers--who all probably cringe at the thought of what they missed! The Diary Of Anne Frank was rejected 16 times, but now over 30 million copies are currently in print. Many writers write for years, facing rejection, doubt, and discouragement....maybe even some of your very favorite authors, because after all, no one was born published. So if you hold that dream close to your heart, hang on to it. Keep learning. Keep growing as a writer. Be open to advice. And best wishes to you as you pursue those dreams!